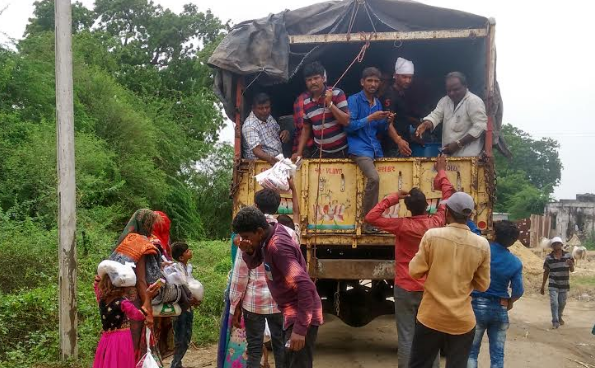 As one drove down from village Baspa, about 15 km from Sami, to Radhanpur in North Gujarat, memories of the 2001 earthquake of Gujarat came alive. One could see that once again the human disaster was greater than the natural in the wake of the floods. Banas waters had washed away one side of the national highway. At a distance, minor Narmada-linked canals had swept like paper trash. The maldharis had taken over one side of the road with their buffaloes as self-possessed shelter. A relief truck was flinging bundles of used clothes at the local people that eagerly waited for it. A pillion rider on a motorbike managed to fetch one such bundle of clothes and shoved it in an empty travel bag. The highway from Radhanpur to Byavar had a great deal of police presence, as there were numerous politicians visiting the area. Village Runi in Kankrej area has a Jain temple, whose property spread is spread over 20 bighas of land, surrounded by a compound wall. Part of the wall had collapsed. Across the road, opposite the temple, is the Dalit area, with living quarters of leather workers and scavengers. Most homes have one living room, barely eight feet by eight feet, with an open extension with an overhead roof serving as veranda. Some people had managed to empty their homes of the sludge and sand that had filled the living room up to the ceiling. The water levels had risen in this area to about 13 feet from the ground. People had taken shelter on the top floor of the village co-operative society, or over the small terraces, braving the rains and winds for about 30 hours before the army reached them with some biscuits. In a one room house with terrace, a young Dalit had lost all his post-graduate degree certificates. Two primary school children were found drying their books on the terrace, tarred with dirt and water. 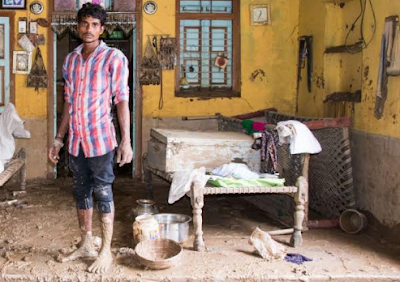 The rich in the village had access to the JCB machines, as Dalits waited to hire tractors to dump away rotten grain, beddings and other soiled material from their quarters. The government did not pay them the rent for hiring the tractors. The scavenger families were still stuck with their quarters filled with sludge, as many of the old people were unable to clear it themselves in the absence of their young children away as migrant labor force. An old woman had the assistance of her two son-in-laws, who had come specially to help their mother-in-law to clear her one-room home, as there was no other place for her today. An old man was sitting in one corner. He had lost his buffalo. He earned his living by playing drum and making supda, the caste-based occupations. 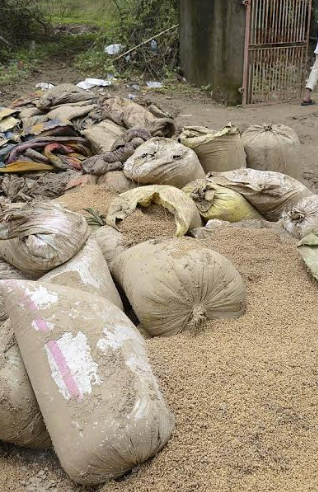 Each Dalit family had lost an average of 800 kg of grain that they had stored, part of the community system of storing one year of ration for the family. At the centre of the village under a tree lay a heap of used garments dumped by relief workers, as there were no takers. Some families of the Majirana community sat in the midst of an open land around the mud homes with bamboo roofs, which had tumbled on the ground. People in the village had never ever in the history of their life met with such tragedy. They said they were battered by the main Narmada canal. At a distance, the canal was visible, it was unable to withstand the pressure of rising water levels. As per the people, wild weed gando baval trees have deep roots which have penetrated the base of the canal, weakening its lining. 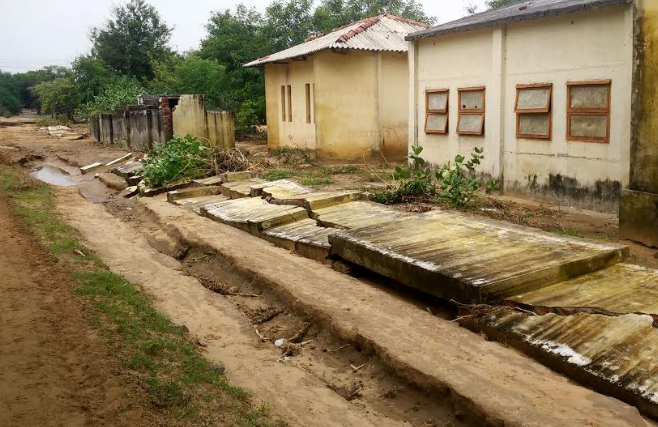 A pucca cement-brick boundary wall, which Dalits had bargain from the village panchayat around their dwellings, constructed barely six months back, had collapsed, as it did not have deep foundations required and mandated by law. In village Khariya, where at least 22 bodies were found from beneath the sand, the road had washed away at the end of the village. Several villages could be seen at a far distance, submerged in flood waters, accessible only by boat. The police and local volunteers were guarding the queue of people, whose homes were on the other side, waiting their turn to the two boats that were meant to ferry them. Although their homes were flooded, all that the relief teams were focusing was on relief distribution. Large stack of mattresses were locked away in a room awaiting distribution. Relief teams had their flags on vehicles. The Khastriya-Thakor Sena and RSS were more visible. Caste distinctions and prejudices seemed intact; they had refused to be washed away with flood waters. It wasn’t uncommon for those who were distributing relief asking for the caste of those seeking it. During an animated conversation, Dalit rights activists Narendabhai, Mohanbhai and Kalpeshbhai of the village said, one class of people who have smile on their faces is the sand mafia. The Banas had brought along with it flood water multi-million tonnes of sand, which is already finding its way even to Ahmedabad construction sites.